As an intuitive person I perceive energies in homes and churches in order to do house clearings, exorcisms and have a good understanding of the energetic dynamics of an establishment. This is something I have enjoyed for the last 10 years as a profession and hobby. I have learned through visiting a variety of churches in Europe and the United States that each church has its own resonance of energy. Each church is created due to a variety of factors creating a underlying personality separate from the buildings architectural design, church members style of worship and religious effigies. All of these aspects contribute to a personality of the church. Some churches can be expansive, positive, uplifting and a welcomed spiritual experience. Other churches appear to have an underlying energy attracting darkness, they may appear to be a beacon of a higher power but have other hidden components that are dancing with the demonic. There are a variety of reasons why some churches expand you while others do not. Below are some concepts of how the energetic dynamics of a church are created. What is the intensity and power of belief of the people praying in the church? Are the people coming of a higher commitment to God? What is the age of the church? Prayer and the intention of people in the church are like an energetic residue that accumulates within the church. Some of the churches that have had hundreds of years of prayer in a sincere fashion create a divine feeling upon entering the church. A good example would be in Southern France, Marie De La Mer (Mary By The Sea). A simple church where people have prayed in salutations to Jesus and Mary Magdalene for hundreds of years, upon entering the church a feeling of calm rushed through me and I knew instantly I was in a truly holy and sacred place. How is the ritual of spiritual ‘setting of the foundations’ of the church? This is a critical aspect of Catholic churches in Europe and the United States but more so in Europe. Often, the Catholic churches were built on power spots that were already established as sacred sites are worshiped by pagan groups. In those days the Catholics were establishing dominance in a community and build their churches on these places showing they were the new religion and the sites for energetically powerful. However, the Catholic Church was more designed to connect to heaven or above in the pagan sites were communing with the earth and spirits of those realms. In the church’s wisdom they created rituals to block the energies of the Earth from entering into the church, most likely because they wanted a different feel than what the pagans were inviting to the sacred site. In doing so they often blocked the energy in the church and it felt less dynamic. 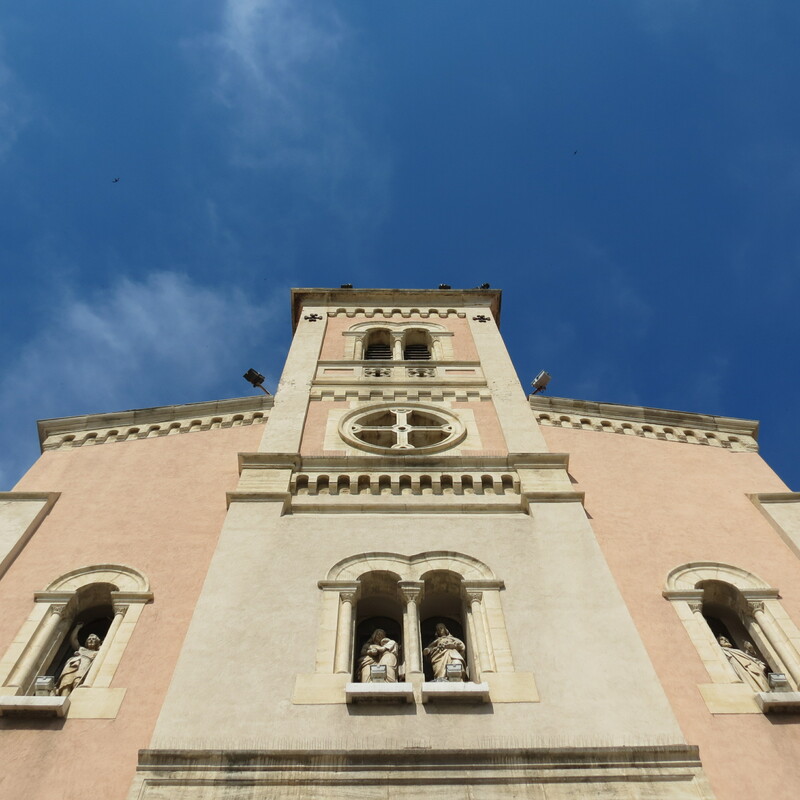 Some of the churches in Southern France have maintained a dynamic flow of energy from both earth and heaven. Often the Southern France churches have a direct connection and worship of Mary Magdalene or there is just a beautiful flow of energy from the two realms, earth and sky (heaven). A great example would be the world-famous, tiny church, Rennes Le Chateau. Built on a sacred site that is over 2000 years old in a time where Romans and Visigoths lived in the area. What is the intention the church is practiced over the years? Some churches are designed to invite the power of Angels or beings from my higher dimension into the church. There are gateways for higher spirits to enter and be in the church. They may appear to be normal cathedral like churches, dark, cold with religious effigies of Jesus, Mary etc. but there is something very different about these places. Somewhere in the design of the churches people actively created portals where higher beings entered. I do not know how the Catholics did it but some of the symbols energetically create openings for gateways (doorways for beings from higher dimensions and/or Angels to enter). A great example would be The Catherdreal of St. Jean De Baptiste in Perpignan, France. Is the church connected to darker energies? Some Catholic churches have had a variety of demonic type of rituals occur and acts of darkness committed within the church. The churches are literally connected to the darker energies within the earth. There is such a place where gargoyles and demonic creatures exist, etherically living in our world. Maybe in the churches they felt a duality of heaven and hell was needed as often these churches have that type of punitiveness and adoration of God as a message throughout the church. A good example is the main church in Albi, France, and this site where over 1000 Cathars came for sanctuary in the 12th century, only to be slaughtered once inside the walls of the church. Such acts of violence and cruelty are not forgotten in the energetic memory for church and attract other similar vibrations. The great cathedral of Notre Dame, Paris France has a similar type of energy. Although there or no known acts of such violence there is a feeling of negativity in the church. At the same time, the church is inspiring and beautiful. As you look at the design of the churches exterior it has hundreds of statues of Angels and Gargoyles once again the establishment of good and evil. It is unfortunate the churches believe we have to have demonic presences as a reminder. In some form it is an invitation and the energy of Notre Dame embodies the good and evil of the energies of the Earth. Churches do not have to remain in a negative state. In fact, the negative rituals that created such dark energies are most likely forgotten by the church members and clergy. However, on a subtle level they still exist. We do not have to be scared of these churches but aware. One person with awareness of the dynamics of the church can be the catalyst for the church to change. It is good for us to ask questions about what is the energy like in a church and then do our own spiritual work to change it. These public institutions along to all of us and we all have a right to contribute to their growth and transformation. I promote for those courageous, conscious few who are willing to step forward and create change wherever they go. Regardless of the darkness these churches have been revered for centuries and hold a special message. We can commune with god, Jesus, or the Marys in these places. We need to remember the infinite presence of spirit is stronger than any negative forces. Enjoy these special places.